Getting greasy is a kid's thing, not something encouraged at a professional bicycle store. So when a product comes along that takes the mess out of cleaning bicycle parts, and does it in only 10 minutes, well, you have to take notice. Want to take that heavy film off of a new bicycle chain? The Crest can do it in 10 minutes. Completely clean a drive train? Again, it takes the Crest a mere 10 minutes. Plus, with a Crest Ultrasonic System, you can leave the parts to clean while you perform other tasks. And the Crest performs its tasks economically, as well. A drive train? How does 75¢ sound? A chain? Do you have a quarter? 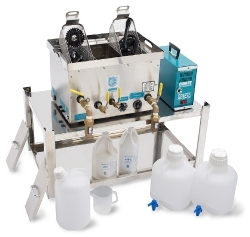 In addition, if you purchase a Crest system that allows for conservation of the chemicals and lube, the per parts cleaning cost drops by two-thirds. "Bicycle shops are amazed at how quickly and efficiently the Crest Ultrasonic System cleans bike parts," says Greg Infante, President of CMR Sales, Inc., the Crest distributor in the bicycle market. "And while the system cleans, the shop employee can be doing other tasks. Plus, the system is completely eco-friendly." How does ultrasonic cleaning work? Through a generator built into the Crest system, voltage is produced which emits acoustic frequencies at 40,000 cycles per second . The high frequencies invoke sound waves into the cleaning solution which produce alternate zones of high and low pressures. During the low pressure cycle, tiny bubbles are formed which collapse in the high pressure of the next half cycle. As the bubbles collapse, they release shock waves that, by their scouring action, dislodge contaminates from the surface of bike parts. The end result is an ultra-clean bicycle part. Completely Safe  chemicals are non-hazardous, biodegradable and emit no odor. "We have many bicycle shops using our cleaning systems including Trek Bicycle Stores with excellent results," says Infante. "They have already discovered the multitude of benefits of our ultrasonic cleaning and lubrication process."